Sample chapter from "Abracadabra v1.0"
"ABRACADABRA V1.0" is now finished! At the bottom of this page you can dowload the pdf version of this book. "Abracadabra v1.0", by Ray Newman is a free book telling the complete story of the making of the Beatles' 1966 album Revolver. Ray is currently aiming for an August release, to coincide with the 40th anniversary of the album. Ray has granted EAR CANDY readers a sneak preview of one of the chapters and we are proud to present, HUNTING TIGERS OUT IN INDIAH. Stay tuned for more about this book, and hopefully an upcoming interview with Ray. 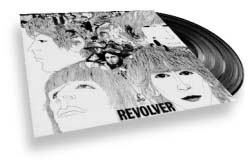 Revolver is the first and last real group effort from the Beatles. The song writing may be portioned out as always - there are tracks which can be identified clearly as Lennon, McCartney or Harrison songs - but the ideas behind them come from a common pool. With their first real break in several years at the start of 1966, the Beatles went out and explored the world individually, and then returned to the fold ready in April 1966. They put their shared ideas and experiences in a pot and stirred. McCartney's contribution was a knowledge of what was new and unusual in the high-brow London art world. Lennon's was his profound fascination with LSD and its associated culture. That fascination may have turned into lsd dependency for him and the rest of the Beatles. George Harrison's contribution to Revolver was India: Indian classical music, Indian instruments, and Indian religion. Most obviously, there is "Love You To". The inclusion of this simple but formally correct piece of Indian classical music marks the first time that such a thing had appeared on a pop record in the West, as well as the emergence of a clearly individual voice for Harrison. The song is not highly regarded in its own right - Ian McDonald calls it "sourly repetitious"3 - and what is more interesting is the way in which its flavours the album as a whole: Indian influences "infect" other songs on the album. This creates connections between otherwise very disparate recordings and giving the whole LP a subtle Indian flavour, easily discernible to those who are looking for it. Harrison provided the droning tamboura backing on "Tomorrow Never Knows", inspired the "little Indian bit" in McCartney's guitar solo on "Taxman", and the vaguely "Eastern" guitar scales in "I'm Only Sleeping" and the much celebrated single b-side "Rain". Harrison must take a lot of credit, therefore, for Revolver's deserved reputation for originality and variety. But how did a working class man from Liverpool, who was barely out of his teens, and had no formal musical training, come to introduce the world at large to this style of music? How did he make the sitar, which was once as obscure as the Shamisen or Cimbalom, a familiar sound in pop music for years to come? It seems in some sense to have been predestined. There seems to have been something in Harrison's very personality which primed him to be receptive. Many of the obituaries published after Harrison's death in 2001 give him the same title, or variations thereon: "The Quiet Beatle", or "The Quiet One" 3. The suggestion in each case was not that Harrison was merely uncommunicative, but rather that he was inward-looking, and more "spiritually aware" than his colleagues. There seems to have been something of a struggle between that tendency to spirituality, and an eager materialism: when not writing about Love and the destruction of the Ego, let us remember, Harrison was giving us "Taxman", with its unequivocally avaricious lyric. He spent his later years studying Indian religion, meditating, and driving his collection of expensive sports cars. Hare Krishna versus Formula 1 might be said to sum up his autobiography, in fact. Nonetheless, when Brian Epstein found himself faced with the challenge of marketing the group, he did not see much mileage in publicising Harrison as "the Greedy Beatle". He saw some benefit in presenting them as clones of each other - matching uniforms, matching haircuts - but also realised that each Beatle needed something to set them apart. Picking on one obvious character trait for each member, he emphasised Lennon's authority, McCartney's good looks, Ringo's sense of humour and Harrison's "shyness". He actually was shy - it wasn't just a PR construct - and he was certainly less of a natural showman than his band mates, as various press conferences between 1964 and 1966 demonstrate. In most cases, Harrison speaks only when addressed directly by journalists, or by Lennon and McCartney, who very obviously take the lead in talking to the press. As Derek Taylor, one of the many "fifth Beatles" and a close friend of Harrison's, observed: "he was never the 'public relations' Beatle" 3. There is little evidence of a desire to push himself upfront in musical terms, either. Whether because he wasn't allowed to "show-off", or because he was not a very confident guitarist, [DN] there are no ostentatious guitar solos on the Beatles' records, as there were on singles by The Yardbirds or the Kinks in the same period. His first song writing credit did not come until the introspective and misanthropic "Don't Bother Me", released on their 2nd LP, "With the Beatles" in 1963. The song plays partly into the public image Epstein was cultivating for Harrison, but is also a sincere expression of irritation at being so thoroughly in the public eye at all times. It was at Studio One, Twickenham Studios , in the south west suburbs of London whilst filming the second Beatles feature "Help!" that Harrison first laid eyes upon the stringed instrument with its characteristic bowl-like body. Although the experience itself was profound, it was surely so despite the context. Director Richard Lester had dressed a scene set in an Indian restaurant - the "Rajahama" - with a group of white actors miming to an Indian-sounding backing track. In the sequence in the film, they brandish a range of distinctly non-Indian looking flutes and bongo drums, but one plays a real sitar. This was presumably dug-up from the prop-room at Twickenham, or rented for the occasion. The various Beatles, who were finding the making of Help! a less exciting experience than their first film and were bored for long stretches, couldn't resist "having a go" on it. McCartney was even photographed with the instrument. It was Harrison, however, who was genuinely fascinated. Despite the plainly irreverent context of this experience, it primed Harrison for further encounters with the sitar during 1965, and he kept his eyes and ears open for more information about Indian music. The next significant event in the story took place whilst the band were touring the United States in the summer of 1965. Mid-tour, the band took a two week holiday in Los Angeles, California. On the 24th of August, they hosted a party at the house they had borrowed - 2850 Benedict Canyon Drive, Hollywood. In attendance where members of Los Angeles folk-rock group The Byrds. David Crosby and Roger McGuinn were well educated and from comfortable middle class backgrounds, and had come to pop music only after periods working as session folk musicians and on the cafe folk music scene. Their interest ranged from jazz, through blues and Celtic balladry, to what we we now call "World Music". In 1966, they were to record and release their own pocket Revolver, the astounding single "Eight Miles High", which combines Indian influenced "raga", psychedelic lyrics and Beatles-style harmonies. In 1965, however, they were yet to record anything demonstrating an Indian influence, though they shared Harrison's nascent interest in the sitar. Although neither played the instrument, they were familiar with it through the music of Ravi Shankar, of whom they were enthusiastic fans. At that time, Shankar was the most famous Indian musician in the world. He had worked on soundtracks for the acclaimed films of Indian director Satyajit Ray5, and was the Indian musician as far as British and American audiences were concerned. He had also recorded in Los Angeles during the early 1960s, and Crosby had attended several of these sessions, which first-hand experience of Shankar's virtuosity made him a particularly keen advocate. At that party in Los Angeles, Crosby, McGuinn and Harrison sat for some time discussing music and playing records which the Byrds had brought with them. They played guitar together and Harrison was undoubtedly flattered to be treated with such esteem by his knowledgeable and successful American peers. The Byrds were open about the influence Harrison's guitar style had had on their own music - they chose their signature 12 string guitars after seeing Harrison play one in "A Hard Day's Night" - and Harrison returned the favour shortly after meeting Crosby and McGuinn, when he recorded "If I Needed Someone" in their style for "Rubber Soul". This friendship was to last for many years, but in the short term, the result was that, inspired by their enthusiasm for Shankar, Harrison bought copies of several of his LPs - probably including his "latest", "Portrait of Genius" (1964) - and took them home to the UK to absorb. It didn't take long for him to decide that he needed his own instrument, and he quickly found one, at "a little shop at the top of Oxford Street called Indiacraft - it stocked little carvings, and incense. It was a real crummy-quality one, actually." India for many of us at that time was fully represented by Indiacraft, a shop bristling with good from India, which appeared opposite Selfridges on Oxford Street in London, and which became the shrine where everyone went to buy their sticks of incense, beads and silk scarves, trying in vain to look like on the Kinks, the Moody Blues or George Harrison. As Harrison notes, the sitar itself was a cheap model probably intended to be decorative, rather than to be used in any meaningful way. It was certainly a far cry from the extremely expensive, hand crafted sitar Harrison was to buy on his first trip to India in late 1966. That model was made by Rikhi Ram, who is widely regarded as the maker of the best instruments in the world. Neither the poor quality of that first instrument, nor a complete lack of instruction, however, stopped Harrison from learning to play, albeit in rudimentary fashion. He, the other Beatles, and in fact most of the mid-1960s rock royalty, had learned to play with cheap or even home-made guitars and amplifiers, and this was no different. Harrison's fumbling persistence bore fruit when, with the instrument tuned like a guitar and an improvised, incorrect, and uncomfortable playing posture, he recorded a nonetheless effective instrumental overdub for Lennon's song "Norwegian Wood" on "Rubber Soul". These various factors combine to produce a sound which is somewhat mournful and rigid. The effort was worth it, however, as the sound elevates what is otherwise an effective Bob Dylan pastiche - which might have fit on any of the band's preceding three albums - into one of the Beatles' most enduring recordings. Lennon's lyrics deal with the experience of an illicit sexual encounter in a minimalist flat, and the mysterious, buzzing overdub underlines a sense of inscrutability and exoticism. It sounds "hip". Much as television and film producers would use the sound of a sitar or a "bongo" to imply the presence of drugs where they couldn't show them, Lennon uses the sitar here to hint at something outré which cannot be made explicit. When we were using the sitars, the problem we had was the Indian musicians could not count bars like we do. And you're doing this semi-live on a four-track machine. I was trying to tell them when to stop, and they couldn't stop. Jeff [Beck] was there listening to all these things. he went to the bathroom and started working.... he played me this sitar sound, through a fuzzbox. This trick was much imitated. Many "Indian" sounding records of the late 1960s actually feature guitars so processed. A 1968 American radio advertisement for Vox's famous "Wah-Wah" pedal makes much of how that device, more famous for its "crying" solo sound or its use on numerous funk recordings, can be used to simulate a sitar sound1. Later in the 1960s, "electric sitars" were even released by guitar makers like Coral and Danelectro. The Kinks' unusual sounding May 1965 single "See My Friends" is also often cited as an early example of the Indian sound. It doesn't feature any Indian instruments, but a guitar is treated so as to sound more "droning", in imitation of a tambura9, and the tune itself has as its hook a very oriental sounding vocal full of sliding notes. Ultimately, though, it is Harrison and The Beatles who gets the credit for the first pop recording to be released featuring the sound of an actual sitar, rather than an imitation. In the six month gap between the release of Rubber Soul and Revolver, Brian Jones of the Rolling Stones borrowed George's instrument and used it on "Paint it Black", released on Aftermath. That recording has the distinction of being the first pop single to feature a sitar, but is hardly ground breaking - the sitar overdub is very much in the same single-note style as Harrison's contribution to "Norwegian Wood". That kind of arbitrary shackling of the sitar to otherwise conventional pop songs would soon look naive, after Harrison took things a step further by actually writing a song which borrowed entire melodies and structures from bona fide Indian classical music. It was during those Norwegian wood sessions that Harrison first came upon an organisation which was to guide him toward an appreciation, and formal study, of Indian classical music: the Asian Music Circle (AMC), based in Finchley, North London. When one of the cheap strings on his equally cheap sitar broke, Harrison found himself at a loss as to how to replace it. Thankfully, EMI had, in their vast and bureaucratic record section, the name and number of the AMC's founder, Ayana Deva Angadi, who they had occasionally turned to in the past as a kind of consultant on Indian music. George Martin seconded the suggestion of contacting Angadi in Finchley. The Beatles' producer and musical advisor was familiar with the Asian Music Circle. Before discovering the Beatles, when Parlophone was still a label known for its comedy and novelty recordings, Martin had produced several records for Peter Sellers, including, most notably, his 1960 collaboration with Sophia Loren, "Goodness Gracious Me". On it, Sellers mimicked an Indian, speaking with a heavy accent. It was for a follow-up to this hit single, however, that Martin called on the AMC to provide authentic Indian musicians. Recording "Wouldn't It Be Nice" meant that Martin had prior experience of recording these unusual instruments, and had actually met many of the AMC's members. It was Ringo - presumably because he had little to do in the studio, and was a personable young man - who was given the job of making the call. "There's a story in my family, which I don't believe, that my father had never heard of the Beatles," says Shankara Angadi, Ayana's son. "He was heard shouting into the telephone: 'Yes, but Ringo who?' As luck would have it, we did have some sitar strings in the house, and the whole family went down to the studio at Abbey Road and watched them record, from behind the glass. My mother drew several sketches of them recording 'Norwegian Wood', which are still in the family." Bouyed by a warm response to "Norwegian Wood", and more in love than ever with the sound of the instrument, Harrison went back to Ayana Angadi. He knew that his performance was weak by the standards of Indian musicians, however groundbreaking it had seemed on a pop record, and wanted to learn. So commenced a relationship which, although brief, was to shape the rest of Harrison's life. The AMC is usually summed up, in lazy paraphrases of Harrison's own line in I Me Mine, his scanty autobiography, as "The North London Asian Music Circle run by Mr Anghadi [sic]", but it is in itself a fascinating story. An interest in Indian culture was not a new thing in 1965, although it had not really penetrated the popular culture until then. In London's Bohemian, mostly left-wing intellectual circles, people had been dabbling with an appreciation of Indian art for some time. Many of them were introduced to it by Ayana Angadi, and by his wife, Patricia. "My father came to Britain in the 1920s10 to finish a degree in Mathematics he'd started at Bombay University. He was very striking looking, with long-hair and aquiline features, and that went to his head. He never really did any work, and just lived as a kind of toy boy to various socialist women for ten years or so. Then he met my mother. One version of the story is that she saw him from the top of a bus on Regent Street and said: I have to paint that man. Which is a euphemism," says Shankara Angadi. Patricia Fell-Clarke was the artistically inclined wayward daughter of an upper-middle-class industrial family which had become wealthy making and selling paint. They, and much of London's middle class, were aghast at the idea of her marrying an unemployed Indian Trotskyist10, however charming. Despite abortive attempts by her family to buy him off, they did marry, and moved into the Fell-Clark's enormous town house on Fitzalan Avenue in Swiss Cottage, North London. It was from here, in the mid-1950s, that Patricia and Ayana Angadi began the slow process of bringing Indian art to the chattering classes. They imported musicians and dancers, putting them up and, in their own chaotic way, organising and promoting tours. Some musicians stayed, forming the core of a musical "repertory group" who, as well as performing in their own right, would back visiting celebrity musicians, or hire themselves out to record and film companies. It was this informal organisation which eventually coagulated into the Asian Music Circle, picking up celebrity members along the way. Yehudi Menhuin was the AMC's President for some time, and Benjamin Britten Vice President. Menuhin's name, and Ayana Angadi's talent for self-publicity, meant that The Times from the mid-1950s onward frequently included advertisements for their lectures or concerts, as well as feature articles highlighting the growing interest in Indian music. Harrison became a frequent visitor to the Angadi's home on Fitzalan Road in Finchley, North Lodon, turning up several times a week in either a green Ferrari, or his black Mini Cooper, with Patti Boyd in tow. He would stay for dinner and play tapes of the latest recording sessions to the family. Shankara Angadi recalls being impressed by "Rain", on which he recognised an Indian influence, but less so by "Paperback Writer". "We told him that it was a step backward, that it was harmonically uninteresting," he recalls. Harrison and Patti Boyd posed for a portrait by Patricia Angadi over the course of several weeks, sketches for which are prized possessions of Shankara's son Daniel. There were, at that time, two incumbent sitar players on the AMC's "books", and it was one of them who was to be introduced to Harrison and become his teacher. Unfortunately, no-one seems to remember his name. "He was very generous with George, who impressed us with his dedication. He studied hard, and appreciated how difficult it was to learn the sitar well - there was no arrogance about this, even though, at times, the Beatles could be quite arrogant people. George would come every week and show us the exercises he had learned." Ian McDonald suggests that the sitar part on Revolver's "Love You To", although not credited, might have been played by the anonymous tutor, but it is more likely that Harrison played it himself with close supervision. Shortly before recording "Love You To", Harrison asked if the Angadis could facilitate a meeting with Ravi Shankar. They did so, with the younger Angadis hosting at their parents' house in Finchley. Paul McCartney, also keen to meet the Indian sitar hero, turned up unannounced. Shankara: "My sister went around afterward collecting cigarette ends to sell at school. She was thirteen at the time." The meeting was a success, although Shankar was not impressed by tapes of "Norwegian Wood" or "Love You To", and was later embarrassed to have underestimated Harrison's fame. He became Harrison's mentor, and they remained friends for many years. Speaking of the difficulties of recording Indian music in London, Harrison described the sessions players provided by the AMC: "They have jobs like bus-driving during the day and only play in the evenings so some of them just weren't good enough. They were much better than any Western musicians coul do, because it is in their natural style, but it made things very difficult." In these early sessions, Harrison would demonstrate to the session men what he wanted them to play, as he was unable to notate music in the appropriate Indian style (Davies, p353). Harrison's interest in India was somewhat more profound than that of many of his peers, going beyond a desire for unusual sounds, or even an LSD inspired interest in "harmonics". Of his trip to India in September 1966, Harrison said "Ravi and the sitar were excuses... it was a search for spiritual connection" . The seeds of his fascination with Indian religion were germinated entirely by coincidence at around the same time as he first saw a sitar, but were to lay dormant for far longer. Only a month after filming the restaurant scene in Twickenham, Harrison had his first brush with yoga, or rather, with a yogi. This momentous event occurred on Paradise Island, in the Bahamas, on the 24th of February 1965 - Harrison's 22nd birthday. As the band filmed a scene in which Harrison, Lennon and McCartney rode bicycles, hunting for Starr, who had supposedly been kidnapped by Evil Indians, a curious figure approached, bearing gifts. Devananda - "The Flying Swami" - was born in the South Indian region of Kerala in 1927, to a very poor family. Nonetheless, he educated himself, eventually joining the army in pursuit of an education. It was whilst serving in the army that he came across a pamphlet on the teachings of Swami Sivananda, and trekked to Rishikesh (the same Rishikesh later to be made famous by the Beatles), where he became a disciple11. In 1957 he set off to the USA with the aim of promoting his religion but, after some time in Canada, of which country he became a citizen, ended up in the Bahamas. There, he founded the Sivananda Ashram - a meditation centre - and then six others worldwide12. He is perhaps best known for making "peace flights" in an aircraft decorated with psychedelic designs. These included a memorable occasion in 1971 when he dropped leaflets over the Suez Canal, and another in 1983, when he flew his aircraft over the Berlin Wall and into East German airspace, causing a diplomatic incident. Both won his his peace campaign a place in the headlines. 11 He made the news also after campaigning for peace in Northern Ireland with actor Peter Sellers. Though cynics might call him a self-publicist, his primary interest seems to have been in publicising the idea of a peaceful, borderless world, at some risk to his own person. As he says, Harrison didn't really start to study Indian religion in a systematic way until much later. His autobiography is littered with quotations from swamis and gurus of various branches of Indian religion and it is hard to say which particular strain he considered himself loyal to, if any. Hinduism, Buddhism, "Hare Krishna" and other Indian/Eastern religions are all descended from a common root - an ur-religion brought to India by nomadic Ãrya people in around 2000BC11. They brought with them a set of religious texts called "Veda", or "sacred knowledge". It is because they all use these texts as a foundation that the disparate native religions of the modern Indian continent are known as "Vedic". What Vedic religions clearly share is a sense of openness and flexibility with regard to belief - there is no such thing as orthodox Buddhism, for example, and Hinduism is a term covering several sub-religions, some of which believe in a range of "Devas11", whilst others believe that the Devas are different faces of one God. The underlying features of these religions, however, are what appealed to Harrison. Firstly, there is a belief in an underlying, eternal "Truth" - that there is sense in existence. Secondly, there is the idea that that Truth can be seen by anyone lucky enough to experience a moment of clarity, achieved through various acts of devotion, such as meditation, or visits to temple. Harrison was later to become a devoted meditator, and his dabbling in Indian music during 1965-66 can be seen as his groping his way toward Indian religion. That he gave up the sitar, more or less, after 1968 when his interest in meditation and yoga took hold suggests that need for order and sense in his life which the former had once provided was succeeded by the latter. Harrison's interest in Indian music and religion was, if not inspired by LSD, then at least made possible by the sense of wonder and receptiveness to news ideas which the drug inspired in him. Lennon and Harrison became closer during 1965 and 1966 having shared experiences of LSD from which McCartney excluded himself, and it is no coincidence that several of Lennon's songs in this period echo, if not quite openly imitate, some of the sounds and themes of Harrison's. "Rain", the b-side to "Paperback Writer" released before Revolver in 1966, does not feature the sound of a sitar, but the chorus - "Ra-ay-ay-ee-ay-ee-ayn" - is a clear attempt to assimilate "eastern" sounds, although in the case the reference is Middle Eastern. Ringo Starr's drumming, too, is far from being a standard rock beat. Building on the unusual rolling pattern suggested by Paul McCartney for 1965's "Ticket to Ride", Starr came up with something which is "exotic" sounding, in some ill-defined way. Unlike Harrison, neither Lennon nor Starr seemed inspired to create pastiches of Indian music, but the idea of something from outside the Rhythm and Blues/Country and Western/Rock'n'Roll idiom seems to have inspired them. This is also evident in, for example, the tamboura drone underlying "Tomorrow Never Knows", and the "oriental" sounding backwards guitar figures on "I'm Only Sleeping". After Revolver was released, Harrison's interest in Indian music was not only public knowledge, but obvious. Ravi Shankar's fame grew as his association with the Beatles became known, and the sound of the sitar became less of a novelty than a bore. It appeared on film soundtracks and records by bands who, until recently, had been straightforward rhythm'n'blues groups, but were now Psychedelic. Little distinction was made between Indian classical music and LSD in the public's mind: they were both facets of the same trend. Sadly, although the AMC briefly benefited from a wider public interest in Indian music prompted by Harrison's advocacy, he was to break with the group late in 1966. Shankara Angadi: "My father was a difficult character, in some ways. He was chaotic, and never really pulled anything off he set out to do. He probably asked George for money, and that was the end of that relationship. We saw lots of him for six months, but then nothing. When I bumped into him at around the time of the concert for Bangladesh in 1972 , he recognised me, and asked someone who I was. When they told him, I heard him say: 'Well, he's not as bad as his father.'" So, the quietly moody Beatle had become the quietly spiritual Beatle. Indian religion and Indian music provided him with a context for his introspective tendencies - he was not grumpy, but thoughtful; not misanthropic, but meditative. This gave him a stronger sense of identity, which helped him to hold his own against the more dominant Lennon and McCartney. At last, he had found something which was his and his alone, and on which the other Beatles deferred to him. For all the talk of surrendering the ego which was to ensue, Harrison's embracing of Indian religion and culture was more about gaining a sense of self than it was destroying the same. In the Beatles' 1968 animated film "Yellow Submarine", each member of the band is presented as a simplified caricature and, although irritating to the individual Beatles, those reduced representations do sum up how the public perceived each member of the band. The cartoon version of Harrison is a detached and peaceful figure. Significantly, it is the strains of Revolver's "Love You To" which accompany his first appearance on screen as he stands on a hilltop with his arms crossed, eyes directed inscrutably to one-side, beard and mane flowing in the wind. He is presented as a guru, a messiah, a Rasputin-like mystic monk. It is Revolver which defined him as such. 2 Hunter Davies ed. (Blond, 1966), p.249 – a fascinating book, capturing a period when nightclubs were still places you could go for “supper”; the section offering advice on how to pick up gay sailors in London's then very rough docklands has dated. 4 Also note that through the 1960s, the BBC Third Programme – now BBC Radio 3 - was broadcasting regular recitals of Indian classical music on Saturday evenings, which Harrison might have heard. A less highbrow source might also have been the incidental music played in curry houses, cited as an influence by the Kinks as early as 1964 (Doug Hinman, The Kinks: All Day and All of the Night, Backbeat Books 2004, p.32). 5 “George Harrison was The Quiet One. The Shy One. The Serious One. The Sad One.” Obituary, CNN.com, 30/11/2001. 7 http://www.twickenhamstudios.com/history.htm has images of the band on set. 8 Not only were the Indians in the film played by white actors in make-up - amongst them Warren Mitchell (Alf Garnett) as Abdul, and Leo McKern (Rumpole of the Bailey) as Clang – but they are also highly stereotypical. The film treats them in much the same manner as had been the cinematic norm for some time: they are eye-rolling savages, cultists; ruthless, inscrutable villains. There is no record of Harrison being especially concerned at the way Indians are portrayed in “Help!”, although it is likely that this is part of the reason for his later disparaging comments about Help! 9 “Pather Panchali” (1955), “Aparajito” (1957), “Parash Pathar” (1958), “Apur Sansar” (1959), etc. 14 A sitar-like instrument, traditionally used to create an underlying, low-pitched “drone” in Indian classical music. 16 1924, according to Rozina Visram, Asians in Britain: 400 years of history, Pluto Press 2002, p. 290. 23 Devas are not Gods, though the word has the same root as “Deity” in English, and “Deus” in Latin. Rather they are invisible spirit beings, some of whom are elemental, but others of whom are almost like the imps or pixies of European pagan belief. All are powerful to a degree, and there are more than 1000 named Deva in the various spiritual texts. Download Abracadabra! (v0.1) in PDF format.